In these days of financial crisis and austerity measures, everyone’s in need of a good laugh! Who’d have thought that Crawley Town FC could help with that (anyone who has seen the latest pictures of David Hunt’s moustache on Twitter is excluded from answering that question)? 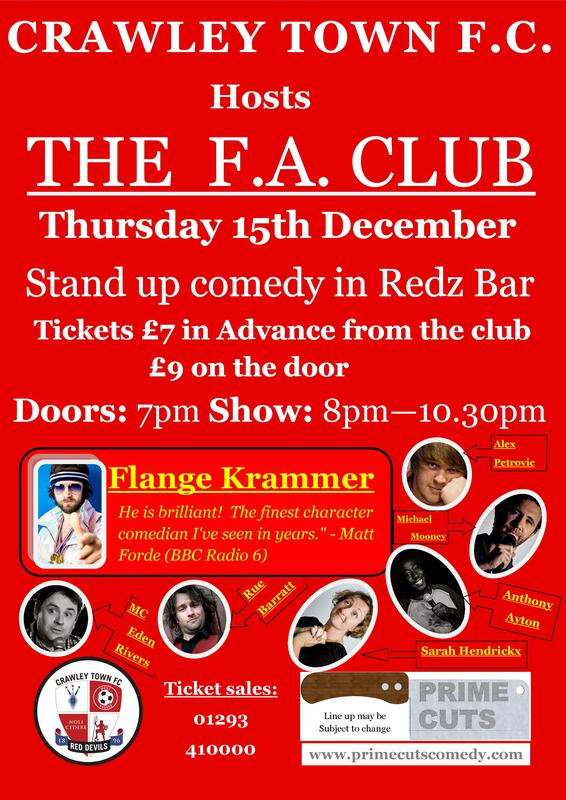 On Thursday 15th December Redz Bar will host its inaugural comedy night, where a selection of Britain’s finest up and coming comedians (and one Bavarian), including the acclaimed Flange Krammer -possibly the son of David Hasselhoff (allegedly! )- will give you up to date skiing tips and Steve Evans will lecture on the secret of a perfect physique (I may have made the last one up). (Sorry for all the brackets, I got a job lot cheap and have to use them up)! Tickets are a measly seven quid in advance and available now from reception, or nine quid on the door. The show starts at 8, but if you like you can turn up a whole hour early, get a pitcher of fine ale, claim the best seats and sneer with contemptuous self regard at any latecomers (that isn’t compulsory, by the way)! Comedy at Redz- be there or be……. somewhere far less amusing…….